Italian restaurant rolling flatware in napkins. He has difficulty separating the sticky backed strips of paper which are wrapped around paper napkins to hold the bundles together. 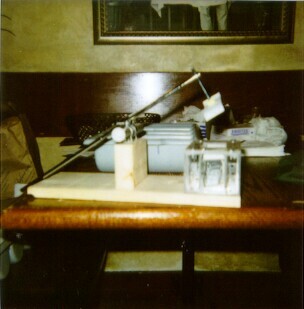 Inspired by a napkin dispenser, a spring loaded box was made from Plexiglas with a hole cut in the top the same width but shorter than the napkin bands. 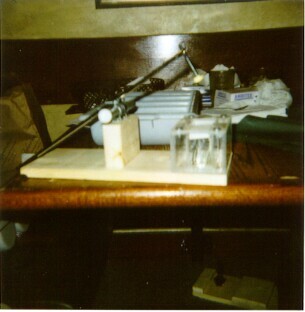 A makeshift spring made from a coat hanger holds the bands against the top of the box. A counterweighted rod with a ball of stick tack is pressed down though the opening to pull out one strip at a time. This jig was nicknamed the "Drinking Bird" in American Sign Language by an interpreter for the Deaf whom had help develop this job for the employee.